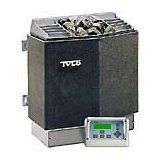 The choice for electric sauna heaters is so varied it’s hard to choose from among the well known companies such as Finlandia, Tylo, Polar, Saunacore, Helo, Harvia, Vico, and Amerec. How do you select an electric heater that’s right for your sauna? 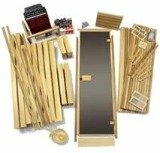 Your first task is to choose the correct heater size to fit the size of the sauna you have or are planning to build. You’ll need about 1kw of power for every 45 cubic foot of sauna space and an additional kilowatt (or two) if the sauna will be located outdoors. Using this general guideline, for example, you would need a 6kw electric heater for a 6’ x 6’ x 7’ sauna (252 cubic ft). Next, you’ll need to decide if you want a wall-mounted unit or free-standing floor model. Most sauna heaters that run on electricity have the option of both since they’ll be well-insulated for wall mounting. Then, as a general rule, you should look for a heater that offers a “standby” mode which will shorten the warm-up time as well as be energy efficient. When you’ve figured out the size and style of electric sauna heaters you want to review, you can then take a look at the control panel it features. All units have a built-in, integrated control panel but some models offer the option of separate controls such as a digital panel that can be mounted conveniently on the outside of the sauna. Here are the best brands to help you narrow down your choices. You really can't go wrong with any of these. If you take a look at the line of Finlandia sauna heaters, they offer all of the features we mention above, in addition to being made of stainless steel and having a rust resistant exterior coat. (Always look for these two items in better quality heaters.) 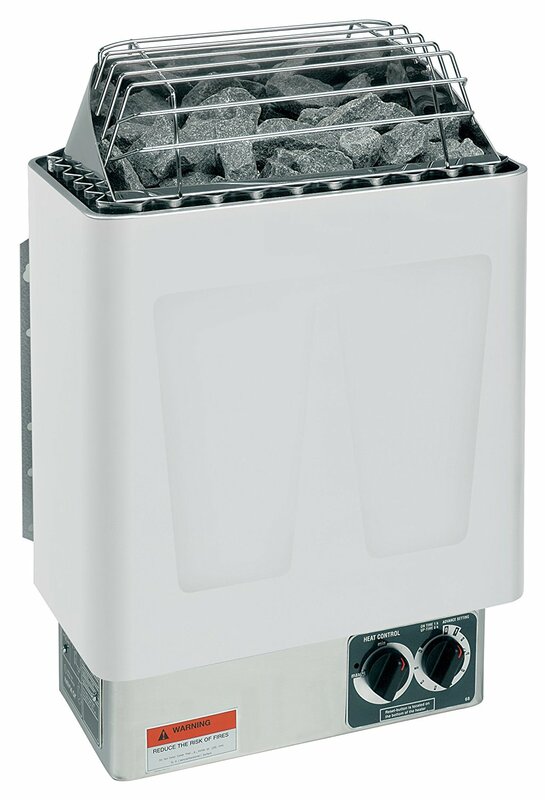 Finlandia electric sauna heaters range from $800 to $2000 and are excellent for a small to medium-size home sauna. Another possible choice is the Amerec sauna heater. 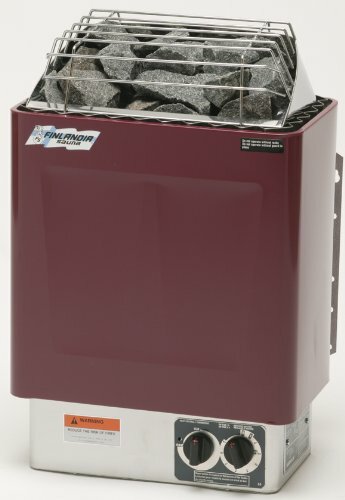 Reasonably priced around $900-$1000, they feature a roomy rock tray where the rocks are in direct contact with the heating elements - an advantage when you want pleasant steam. The built-in controls feature the thermostat and 9+1 timer (1 hour on, with a 9-hour delay). 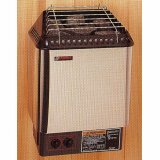 This is a nice electric heater for any size sauna. Saving the best for last, take a look at the large line of Harvia sauna heaters, which range from $700 to $3000. Harvias are made in Finland and while they are considered to be some of the finest commercial sauna heaters on the market, the company also makes home saunas. 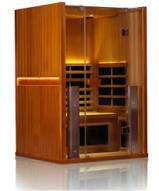 These electric sauna heaters are known for their high quality, long life, safety, low energy consumption and consistent superior performance. Their unique design maximizes the air flow which minimizes warm-up time. 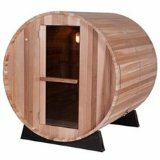 No other sauna heater uses less energy. Harvia sauna heaters were independently tested against competitors and were found to have the highest level of water vaporization (ranging from 84% to 100%) due to the design and placement of the stones. Most other electric heaters showed an enormous amount of the sprinkled water dripping down through the stones and elements to puddle on the floor. This vaporization feature, plus the thermal insulation on the outer mantle and the constant sauna temperature, makes Harvia electric sauna heaters the best choice for your money.